But we don’t stop moving. That’s not what Bostonians do. We’re known for that. We don’t rest when it’s warranted—we’re expected not to, for better or for worse. The suffering continues, the infection spreads, but life still happens. Something keeps us here. I’ve never seen through my threats to move because there’s a light here and a community I still haven’t had the heart to break from. I’m not finished here. In the wintertime, at least in these parts, joy takes more effort. Unlike in the warmer months, when joy comes just from stepping on the porch, joy is something you need to actively pursue. Barring winter sports, these joys can be and usually are very small—cracking a good book, cooking something warm and hardy, planning a movie day. And booze. Yes, that helps warm things up. 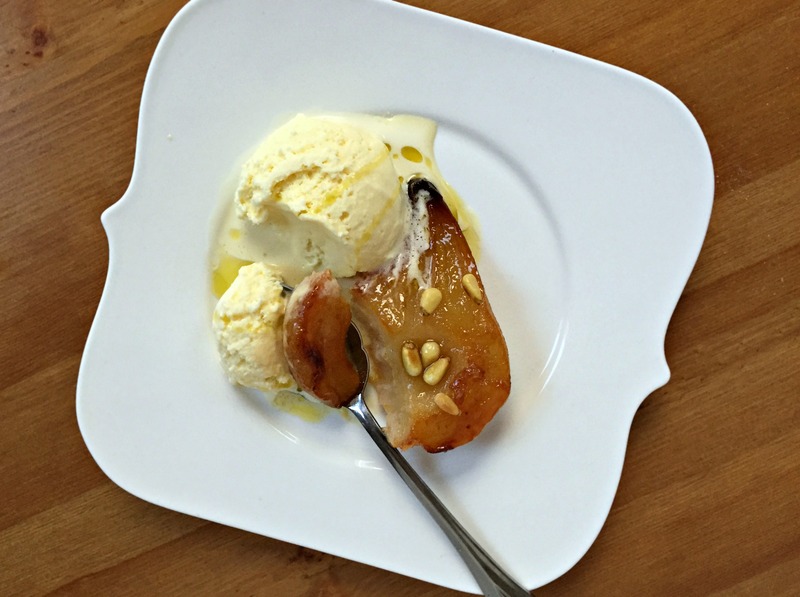 I have tested this recipe for weeks to get the ice cream just right, the process slowed by winter sickness and malaise. And it’s been a little joy to help me through. Warm pears, roasted with olive oil and butter and a modest amount of sugar can do pretty much anything on their own—their perfumed sweetness is a winter pleasure. But they love wine. So topped with a fruity, melting scoop of ultracreamy chardonnay ice cream, the complementary acidity of which wakes you up and reminds you there will be light again, they can uplift. With a thin drizzle of extra-virgin olive oil (I like the savory contrast of a slightly peppery one) and a topping of toasted pine nuts, they can cure. The ice cream doesn’t chill the body; its cold contrast gives the soul a jolt. And if you’re really desperate to get away, you can heap it all in a glass and pour chardonnay over the whole mess. It’s good. I tried. As we’ve established, booze helps. A dessert is eaten in minutes—the joy is brief and fleeting. But I’ll take the break from mundanity. If I’m going to stay here, I must relish in those little breaks. It is best to use a chardonnay from France or another cool climate for this recipe. Warm-climate chardonnays, like California chardonnay, are more buttery and less acidic, so their flavor doesn’t shine in the ice cream. Scoop this ice cream right from the freezer—with all that wine, there’s no need to let it sit. For the ice cream: Place 230 grams (1 cup) heavy cream in medium bowl with strainer set on top. Bring 230 grams (1 cup) heavy cream, milk, sugar, and salt just to boil in small saucepan over medium heat. Meanwhile, whisk egg yolks together in large saucepan. Set up ice bath in large bowl. Pour small amount of hot milk mixture into egg yolks, whisking constantly, to temper, then slowly whisk in remaining milk mixture in steady stream. Cook mixture whisking constantly, over medium heat until line drawn down custard-coated spoon holds and custard registers 170-175 degrees. Pour custard through fine-mesh strainer into cream and whisk to combine. Transfer bowl to ice bath and whisk occasionally until mixture reaches room temperature. Cover bowl with plastic wrap, transfer to refrigerator, and let chill for at least 6 hours or up to 24 hours. While custard is chilling, place 460 grams (2 cups) wine in shallow and preferably nonstick pan and cook over medium-high heat, stirring occasionally, until mixture reduces to 77 grams/1⁄3 cup. Let wine cool completely, cover, and transfer to refrigerator. When custard is chilled, whisk remaining 1⁄3 unreduced wine and reduced wine thoroughly into custard. Churn ice cream in ice cream machine according to manufacturer’s instructions, 15 to 25 minutes (Ice cream will be ever-so-slightly softer than normal because of the inclusion of a fair deal of alcohol.) Transfer ice cream to container and freeze for at least 4 hours before serving. For the pears: Adjust oven rack to middle position and heat oven to 400 degrees. Toss pears, oil, and sugar together in small baking dish. 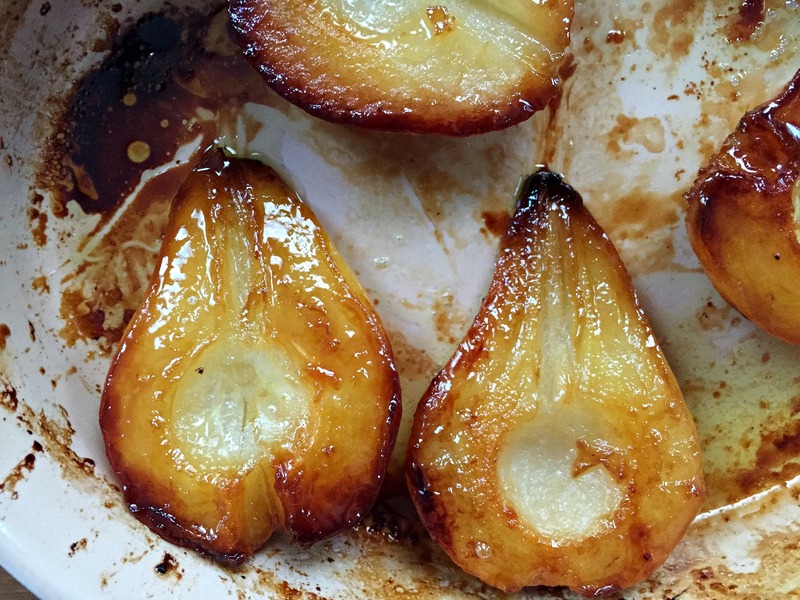 Top pears with butter and roast until butter melts. Toss pears thoroughly to coat in butter and roast, tossing every 15 minutes or so, until a paring knife slips in and out of pears easily and sugar has turned golden and sticky, 1 to 1½ hours. 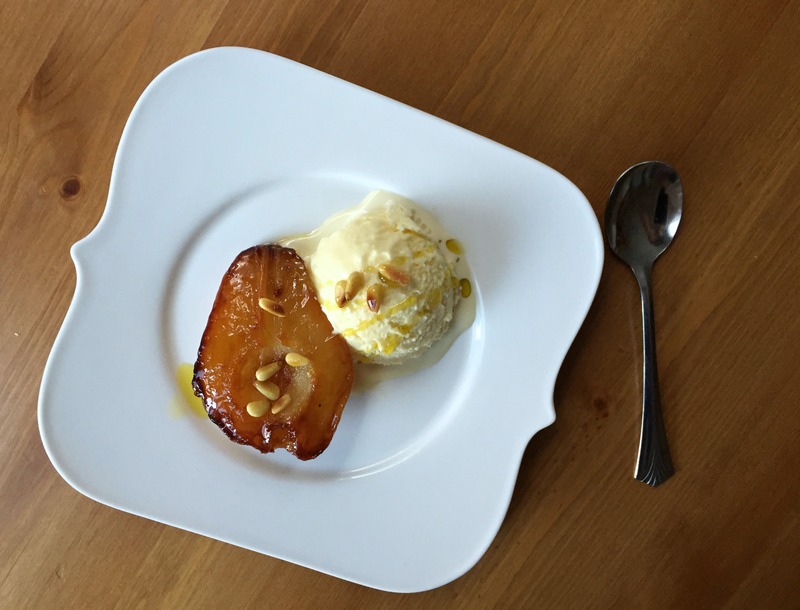 Serve warm pears with ice cream. Sprinkle with pine nuts, if desired. 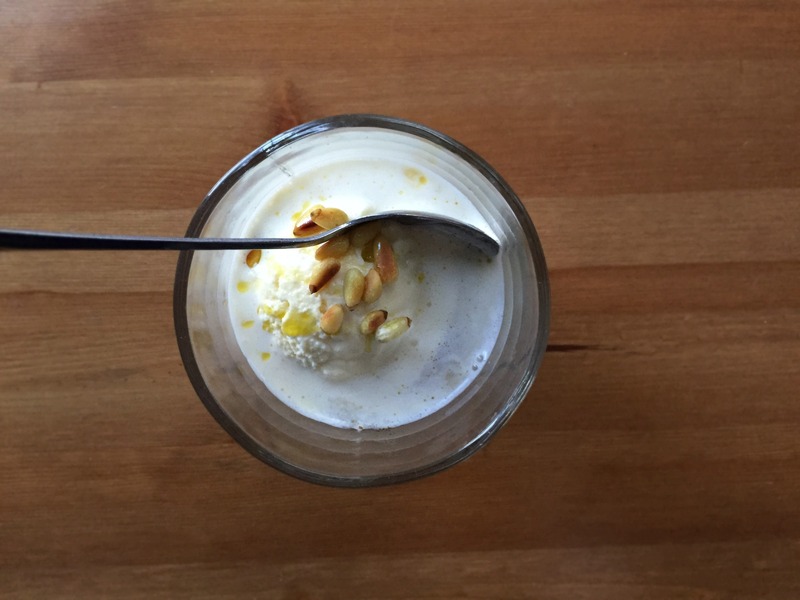 Chardonnay ice cream sounds insanely delicious. 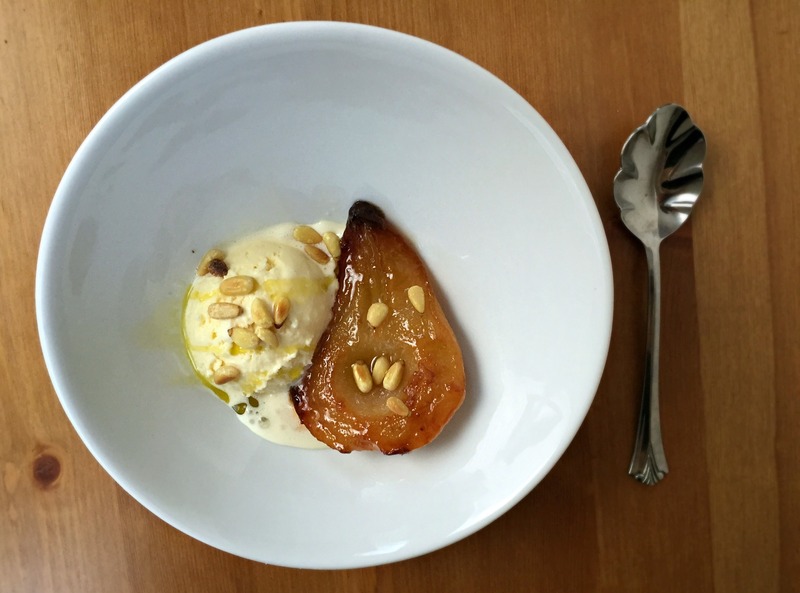 I’ll take a giant scoop with those roasted pears any time, any day of the year! It will end, surely. Can’t imagine how you’ve made it through this awful winter. What a lovely, lovely dessert though! Look at those beautiful sticky pears! I adore the sound of this ice cream too.